As much as I like the idea of shifting an outfit from day to night, I honestly find many instances of it done rather impractically: after all, changing every single element except, say, your blouse basically requires you to carry a whole other ensemble with you all day! Last week, I had a date with D after a casual lunch and errand running in the afternoon. Because I didn’t have a chance to go home, I popped a few items in my bag in an attempt to transition appropriately into the evening festivities. An accessory & footwear swap, quick pop of lip colour, and bag strap removal later, and I felt much more prepared to take on the night. 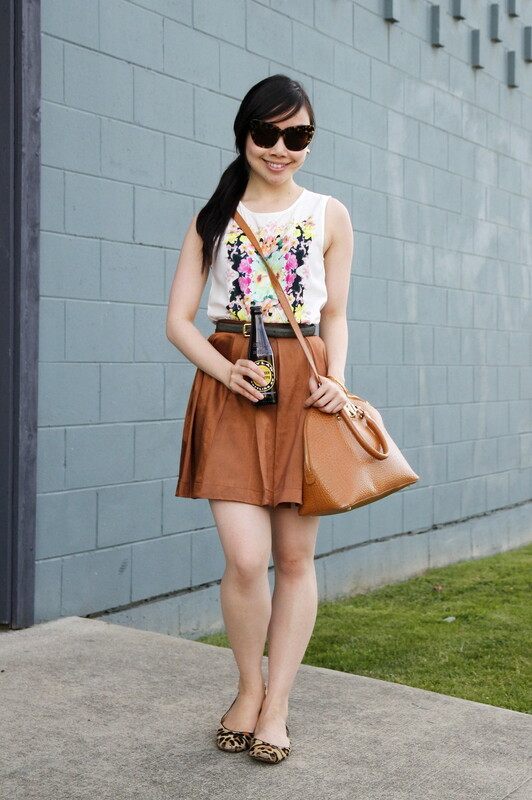 Wearing: h&m blouse, Club Monaco skirt, DKNY bag. I love the print on your top and your brown skirt! 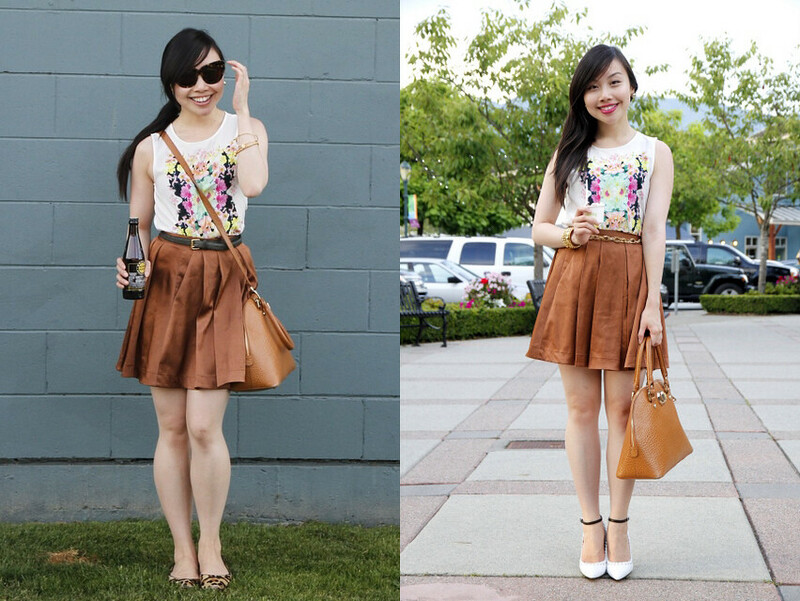 from day to nigth with just a switch of accessories.lovely idea!lovin you bag and heels and that beautiful top. Fun looks! I think makeup is a definite helper in the day-to-night transition, as is flats to heels! Oh you stop being so cute! I love both looks! I think switching shoes is the best option too! shoes definitely transformed your outfit. Great transition! Love the change of accessories and shoes + lipstick! And you look cute on both! Great way to change! I prefer the day outfit. That belt is really beautiful. How is it you can come up with so many cute outfits?! Everytime i read your blog i just want to go shop 🙂 Gorgeous outfit indeed! Very cute! D did such a great job with the photos. The changes in accessories, makeup and hair do make a big difference. I love the H&M blouse, such a pretty mirrored print! great job on the transition, you nailed it! I love this transition and it was really smart. Your observation about the impractical Day-to-Night outfit advice out there is totally spot on. To be honest: I never do Day to Night. I usually dress in whatever would be OK for a night out right at work, or I go home and change, because I don’t work far from home. It’s easier to go home, get a snack, do house work and then change before heading back out. I love both of these outfits! And I find transitioning from day to night to be too bothersome and I usually just don’t bother, haha. As always you look classy and beautiful! Love your shoes and skirt. Your version of a day-to-night look is much more practical than others I’ve seen! I completely agree that having to change out everything except for one piece of clothing isn’t really practical. Your way of changing up the accessories, shoes and a bolder lip really transitions your outfit well. And those Aldo heels are even more amazing on! What an amazing outfit, and what an amazing sense of style you have, I love how you transformed your day outfit to night, super cool! For me personally, I tend to wear a lot of black if I’m going to do a day to night transition and change shoes and jewelry. For example, for day I might wear a sequined blouse, black slacks and black pumps with a cardigan over the blouse buttoned halfway. Then for night, I might slip into open-toed black sequined sandals, remove the cardigan and add some dangling earrings and makeup. I love what you did especially with the belt. It is amazing how shoes and accessories can totally transform your look. i love ur skirt!! and i love the combo with both shoess so pretty! Something as simple as letting your hair down makes such a huge difference!